One-year net survival among head and neck cancer subtypes is highest in salivary glands cancer and lowest in hypopharyngeal cancer. For all head and neck cancer subtypes, one-year survival falls between 1 and 5 years after diagnosis, though the gradient of the fall varies between subtypes. For most head and neck cancer subtypes, one-year survival falls between 5 and 10 years after diagnosis. 60% of men survive hypopharyngeal cancer for at least one year, and this is predicted to fall to 27% surviving for five years or more, as shown by age-standardised net survival for patients diagnosed with hypopharyngeal cancer during 2009-2013 in England. Survival for women is similar with 61% surviving for one year or more, and 30% predicted to survive for at least five years. In men, hypopharyngeal cancer survival continues to fall beyond five years after diagnosis. In women, hypopharyngeal cancer survival is similar at five and ten years after diagnosis. 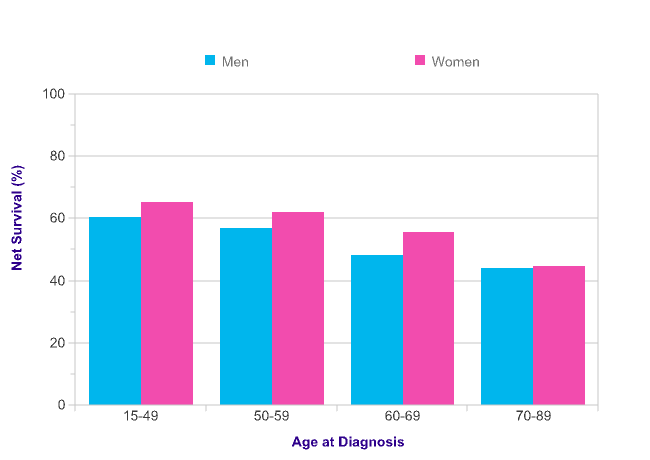 18% of men and 23% of women are predicted to survive their disease for ten years or more, as shown by age-standardised net survival for patients diagnosed with hypopharyngeal cancer during 2009-2013 in England. 85% of men survive laryngeal cancer for at least one year, and this is predicted to fall to 65% surviving for five years or more, as shown by age-standardised net survival for patients diagnosed with laryngeal cancer during 2009-2013 in England. Survival for women is not available due to the low number of cases. Laryngeal cancer survival continues to fall beyond five years after diagnosis. 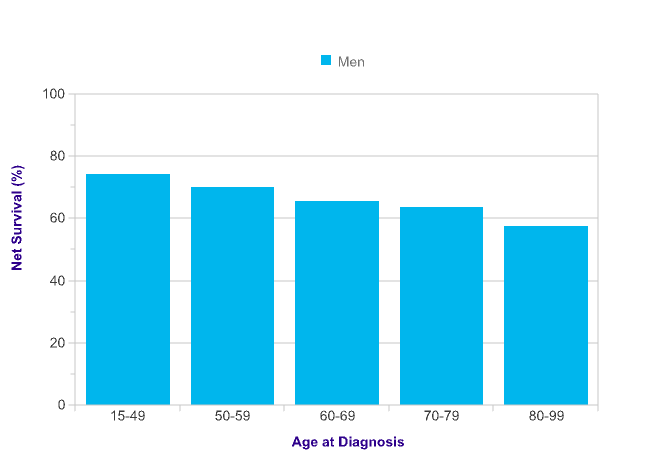 55% of men are predicted to survive their disease for ten years or more, as shown by age-standardised net survival for men diagnosed with laryngeal cancer during 2009-2013 in England. Survival for laryngeal cancer is reported in Scotland, Northern Ireland and Wales[2,3,4] though it is difficult to make survival comparisons between countries due to different methodologies and criteria for including patients in analyses. 78% of men survive oral cavity cancer for at least one year, and this is predicted to fall to 54% surviving for five years or more, as shown by age-standardised net survival for patients diagnosed with oral cavity cancer during 2009-2013 in England. Survival for women is similar to men one year after diagnosis with 79% surviving for one year or more and higher than men at five years after diagnosis with 60% predicted to survive for at least five years. Oral cavity cancer survival continues to fall beyond five years after diagnosis. 42% of men and 50% of women are predicted to survive their disease for ten years or more, as shown by age-standardised net survival for patients diagnosed with oral cavity cancer during 2009-2013 in England. Survival for oral cavity cancer is reported in Scotland, Northern Ireland and Wales[2,3,4] though it is difficult to make survival comparisons between countries due to different methodologies and criteria for including patients in analyses. 84% of men survive oropharyngeal cancer for at least one year, and this is predicted to fall to 66% surviving for five years or more, as shown by age-standardised net survival for patients diagnosed with oropharyngeal cancer during 2009-2013 in England. Survival for women is similar with 84% surviving for one year or more, and 66% predicted to survive for at least five years. Oropharyngeal cancer survival continues to fall beyond five years after diagnosis. 57% of men and 59% of women are predicted to survive their disease for ten years or more, as shown by age-standardised net survival for patients diagnosed with oropharyngeal cancer during 2009-2013 in England. Survival for oropharyngeal cancer is reported in Wales though it is difficult to make survival comparisons between countries due to different methodologies and criteria for including patients in analyses. 83% of men survive salivary glands cancer for at least one year, and this is predicted to fall to 58% surviving for five years or more, as shown by age-standardised net survival for patients diagnosed with salivary glands cancer during 2009-2013 in England. Survival for women is higher with 90% surviving for one year or more, and 78% predicted to survive for at least five years. Salivary glands cancer survival is similar at five and ten years after diagnosis. 51% of men and 70% of women are predicted to survive their disease for ten years or more, as shown by age-standardised net survival for patients diagnosed with salivary glands cancer during 2009-2013 in England. 73% of men survive sinus cancer for at least one year, and this is predicted to fall to 50% surviving for five years or more, as shown by age-standardised net survival for patients diagnosed with sinus cancer during 2009-2013 in England. Survival for women is similar with 78% surviving for one year or more, and 53% predicted to survive for at least five years. In men, sinus cancer survival is similar at five and ten years after diagnosis. In women, sinus cancer continues to fall beyond 5 years. 43% of men and 43% of women are predicted to survive their disease for ten years or more, as shown by age-standardised net survival for patients diagnosed with sinus cancer during 2009-2013 in England. 80% of men survive tongue cancer for at least one year, and this is predicted to fall to 60% surviving for five years or more, as shown by age-standardised net survival for patients diagnosed with tongue cancer during 2009-2013 in England. Survival for women is similar with 81% surviving for one year or more, and 62% predicted to survive for at least five years. Tongue cancer survival continues to fall beyond five years after diagnosis. 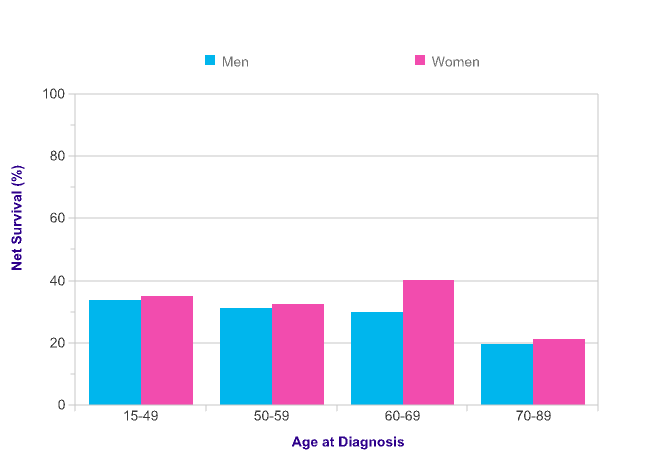 50% of men and 54% of women are predicted to survive their disease for ten years or more, as shown by age-standardised net survival for patients diagnosed with tongue cancer during 2009-2013 in England. Muller P, Belot A, Morris M, Rachet B, Cancer Research UK Cancer Survival Group, London School of Hygiene and Tropical Medicine. Net survival and the probability of cancer death from rare cancers. Available from http://csg.lshtm.ac.uk/rare-cancers/. Accessed July 2016. Welsh Cancer Intelligence and Surveillance Unit. Cancer in Wales: 2001-2004. For most head and neck cancer subtypes survival is higher in younger people and falls with increasing age, though the gradient of the fall varies. Five-year survival for hypopharyngeal cancer is highest in the youngest men and women and decreases with increasing age. Five-year net survival in men ranges from 34% in 15-49 year-olds to 20% in 70-89 year-olds for patients diagnosed with hypopharyngeal cancer in England during 2009-2013. In women, five-year survival ranges from 40% in 60-69 year olds to 21% in 70-89 year olds. Five-year survival for laryngeal cancer is highest in the youngest men and decreases with increasing age. Five-year net survival in men ranges from 74% in 15-49 year-olds to 58% in 80-99 year-olds for patients diagnosed with laryngeal cancer in England during 2009-2013. For women no laryngeal cancer survival data are available, due to the low number of cases. Five-year survival for oral cavity cancer is highest in the youngest men and women and decreases with increasing age. Five-year net survival in men ranges from 68% in 15-49 year-olds to 46% in 70-89 year-olds for patients diagnosed with oral cavity cancer in England during 2009-2013. 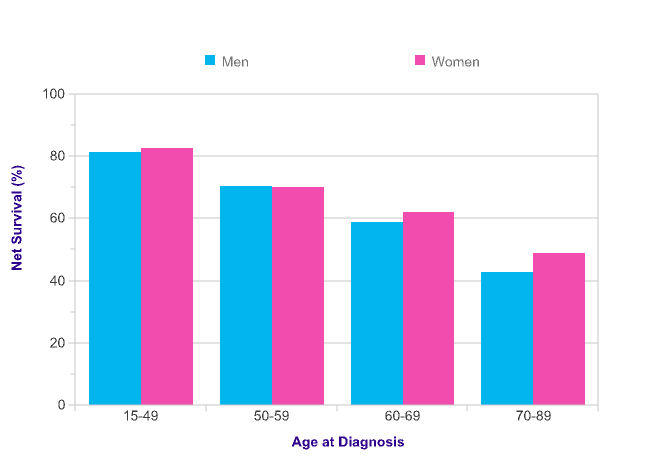 In women, five-year survival ranges from 70% in 15-49 year olds to 51% in 70-89 year olds. Five-year survival for oropharyngeal cancer is highest in the youngest men and women and decreases with increasing age. Five-year net survival in men ranges from 82% in 15-49 year-olds to 43% in 70-89 year-olds for patients diagnosed with oropharyngeal cancer in England during 2009-2013. 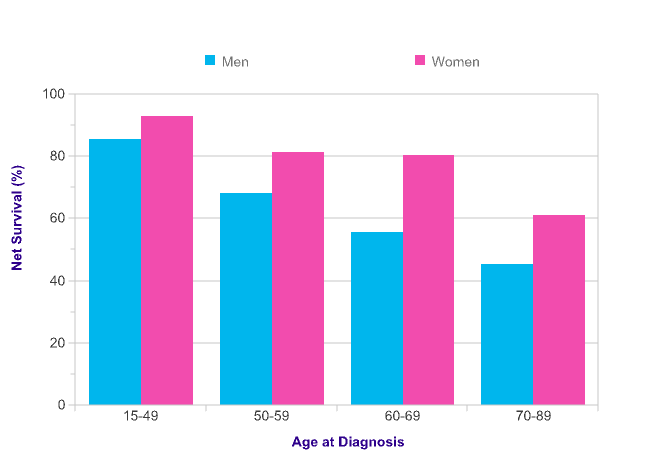 In women, five-year survival ranges from 83% in 15-49 year olds to 49% in 70-89 year olds. Five-year survival for salivary glands cancer is highest in the youngest men and women and decreases with increasing age. Five-year net survival in men ranges from 85% in 15-49 year-olds to 45% in 70-89 year-olds for patients diagnosed with salivary glands cancer in England during 2009-2013. In women, five-year survival ranges from 93% in 15-49 year olds to 61% in 70-89 year olds. Five-year survival for sinus cancer is highest in the youngest men and women and decreases with increasing age. Five-year net survival in men ranges from 60% in 15-49 year-olds to 44% in 70-89 year-olds for patients diagnosed with sinus cancer in England during 2009-2013. In women, five-year survival ranges from 65% in 15-49 year olds to 45% in 70-89 year olds. Five-year survival for tongue cancer is highest in the youngest men and women and decreases with increasing age. Five-year net survival in men ranges from 74% in 15-49 year-olds to 47% in 70-89 year-olds for patients diagnosed with tongue cancer in England during 2009-2013. 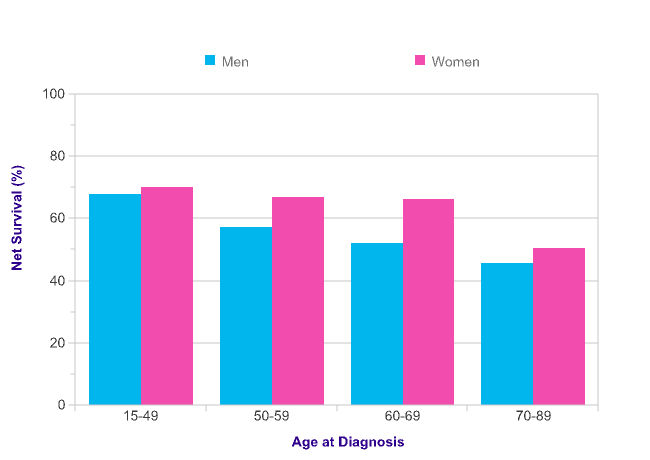 In women, five-year survival ranges from 77% in 15-49 year olds to 52% in 70-89 year olds. Five-year relative survival for hypopharyngeal cancer in men in England (25%) is similar to the average for Europe (24%). Wales (25%), Scotland (25%) and Northern Ireland (35%) are also similar to the European average. Across the European countries for which data is available, five-year relative survival in men ranges from 7% (Estonia) to 35% (Ireland). Five-year relative survival for hypopharyngeal cancer in women in England (26%) is similar to the average for Europe (29%). Scotland (28%) is also similar to the European average. No five-year survival data is available for Wales and Northern Ireland. 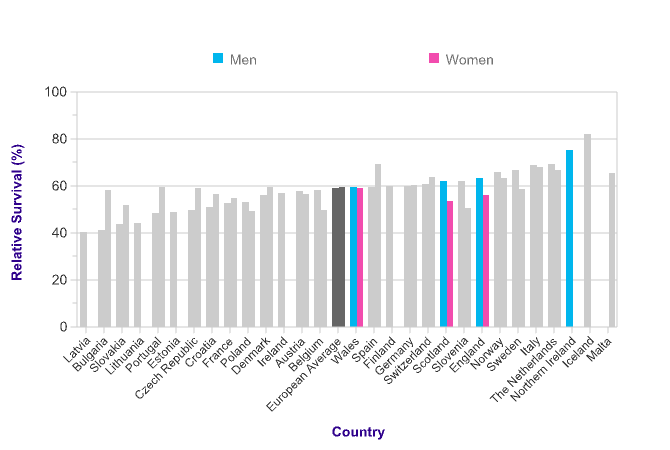 Across the European countries for which data is available, five-year relative survival in women ranges from 19% (Czech Republic) to 52% (Switzerland). Five-year relative survival for laryngeal cancer in men in England (63%) is above the average for Europe (59%). Northern Ireland (75%) is also above the European average but Wales (59%) and Scotland (62%) are similar to the European average. Across the European countries for which data is available, five-year relative survival in men ranges from 40% (Latvia) to 82% (Iceland). Five-year relative survival for laryngeal cancer in women in England (56%) is similar to the average for Europe (60%). Wales (59%) and Scotland (54%) are also similar to the European average. No five-year survival data is available for Northern Ireland. Across the European countries for which data is available, five-year relative survival in women ranges from 49% (Poland) to 69% (Spain). Five-year relative survival for lip cancer in men in England (88%) is similar to the average for Europe (88%). Wales (95%), Scotland (95%) and Northern Ireland (95%) are also similar to the European average. 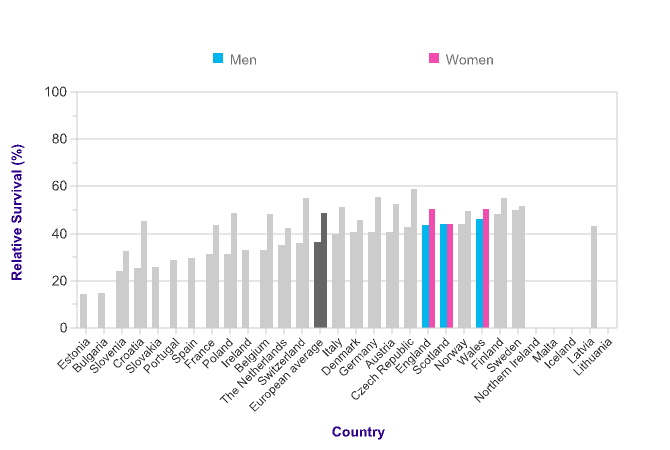 Across the European countries for which data is available, five-year relative survival in men ranges from 74% (Switzerland) to 95% (Scotland). Five-year relative survival for lip cancer in women in England (91%) is similar to the average for Europe (89%). Wales (89%) and Scotland (95%) are also similar to the European average. No five-year survival data is available for Northern Ireland. Across the European countries for which data is available, five-year relative survival in women ranges from 79% (Poland) to 103% (Slovakia). Five-year relative survival for nasopharyngeal cancer in men in England (47%) is similar to the average for Europe (47%). Scotland (40%) and Northern Ireland (61%) are also similar to the European average. No five-year survival data is available for Wales. 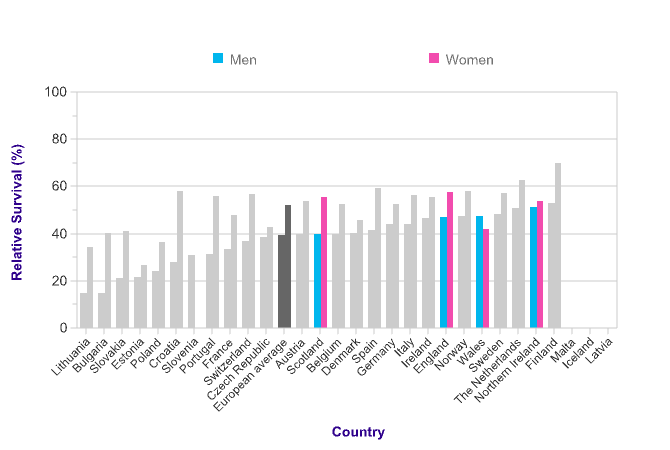 Across the European countries for which data is available, five-year relative survival in men ranges from 27% (Bulgaria) to 75% (Switzerland). Five-year relative survival for nasopharyngeal cancer in women in England (50%) is similar to the average for Europe (55%). Scotland (71%) is above the European average. No five-year survival data is available for Wales and Northern Ireland. Across the European countries for which data is available, five-year relative survival in women ranges from 34% (Latvia) to 71% (Scotland). Five-year relative survival for oropharyngeal cancer in men in England (44%) is above the average for Europe (36%). Wales (46%) is also above the European average but Scotland (44%) is similar to the European average. No five-year survival data is available for Northern Ireland. 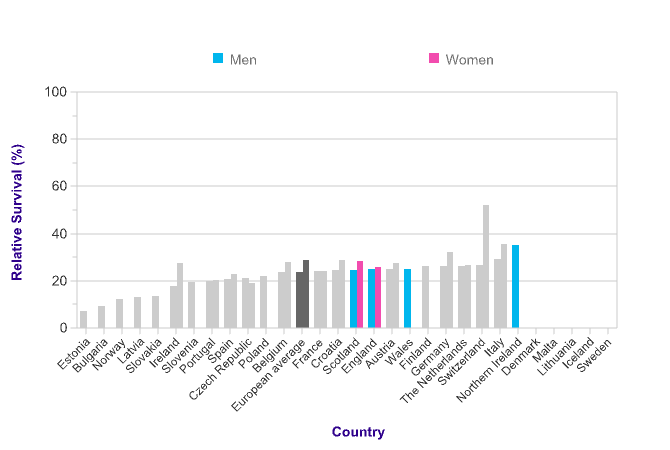 Across the European countries for which data is available, five-year relative survival in men ranges from 14% (Estonia) to 50% (Sweden). Five-year relative survival for oropharyngeal cancer in women in England (50%) is similar to the average for Europe (49%). Wales (50%) and Scotland (44%) are also similar to the European average. No five-year survival data is available for Northern Ireland. 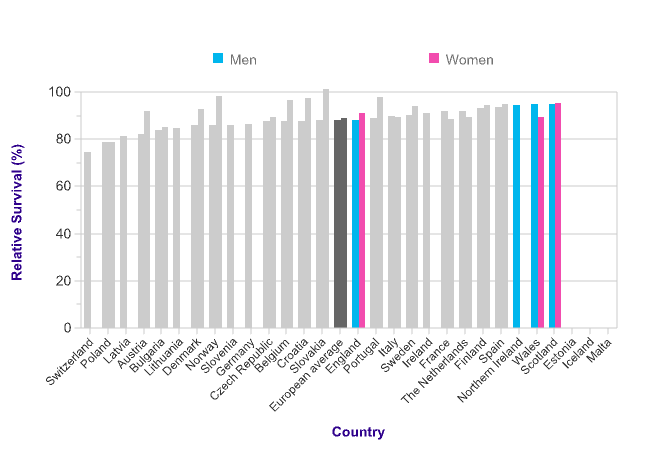 Across the European countries for which data is available, five-year relative survival in women ranges from 33% (Slovenia) to 59% (Czech Republic). Five-year relative survival for tongue cancer in men in England (47%) is above the average for Europe (39%). Northern Ireland (51%) is also above the European average but Wales (47%) and Scotland (40%) are similar to the European average. Across the European countries for which data is available, five-year relative survival in men ranges from 15% (Lithuania) to 53% (Finland). Five-year relative survival for tongue cancer in women in England (58%) is above the average for Europe (52%). Wales (42%), Scotland (56%) and Northern Ireland (54%) are similar to the European average. 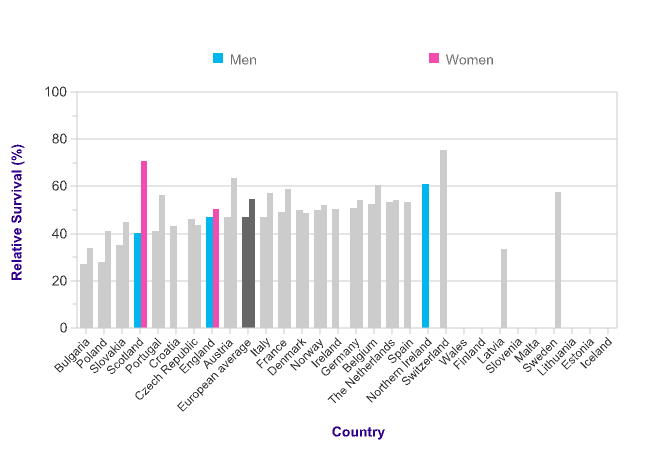 Across the European countries for which data is available, five-year relative survival in women ranges from 27% (Estonia) to 70% (Finland). Data is for: 29 European countries, patients diagnosed in 2000-2007 and followed up to 2008, hypopharyngeal cancer (International Classification of Diseases for Oncology [ICD-O-3] C12.9, C13), laryngeal cancer (ICD-O-3 C32), lip cancer (ICD-O-3 C00), nasopharyngeal cancer (ICD-O-3 C11), oropharyngeal cancer (ICD-O-3 C09-C10), tongue cancer (ICD-O-3 C01.9-C02.9).